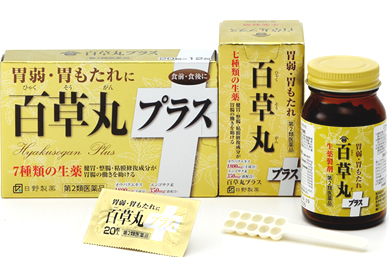 Hyakusogan-Plus is a gastrointestinal medicine. It contains 7 kinds of crud drugs. Hyakusogan-Plus improves the symptoms caused by excessive drinking and eating, dyspepsia, heart burn, indigestion and nausea. It is also effective for improving the symptoms of stomach upset, such as loss of appetite and dyspepsia due to minor changes and stress in daily life, as well as heavy stomach sensations and abdominal bloating associated with fatigue or aging. Hyakusogan-Plus contains phellodendron bark extract, powdered preparations of zedoary, atractylodes rhizome, Japanese gentian and swertia herb, which improve stomach function. These stomachic crude drugs stimulate gustatory and olfactory senses and enhance the secretion of saliva and gastric juice with their bitter tastes and fragrances. It also contains powdered geranium herb, which controls bowel movements. Furthermore, powdered corydalis tuber, which protects the mucosa and repairs inflammation, has been added as a new component. This component can reduce mucosal damage induced by bad habits in daily life. Hyakusogan-Plus is a crude drug product containing these stomachic, gastrointestinal function-controlling and mucosa-restoring components in a well-balanced manner without any synthetic agents. Therefore, it safely controls gastrointestinal functions and relieves unpleasant symptoms through its mild action on the weakened digestive tract. In addition, to increase its stomachic effect, the surface of Hyakusogan-Plus pills is coated with phellodendron tincture so that a bitter taste appears in the mouth immediately after taking it. Our pills are formulated to make the best use of the bitter taste peculiar to crude drugs, despite the fact that regular pills are coated to make them easy to take by reducing bitterness in general. It has been empirically proven that all of the crude drugs contained in Hyakusogan-Plus are highly effective and safe with less adverse effects. Hyakusogan-Plus is recommend to people suffering from poor digestive functions without any specific cause. Always keep it handy together with your other household medicines and take it in accordance with your symptoms either before or after meals. Take the following amount of the medicine with water or warm water 3 times a day, either before or after meal. 1. Consult medical specialists on taking this product with medical treatments. 2. In case of no effect over a month, stop taking this product and consult medical specialists showing the attached instructions. 3. Read the attached instructions carefully before taking the product. 4. Store sealed in cool place without direct sunlight or high humidity. 5. Keep this product out of reach of children. The Japanese name Senburi derives from its strong bitterness that it is still bitter after being decocted one thousand (sen) times.Used for gastrointestinal diseases as bitter stomachic or intestinal remedy, and also as hair growth tonic and for skin diseases. Used for protect such as stomach mucous membrane symptoms. It also exerts an analgesic effect.